Order your microfluidic glass chip on demand! 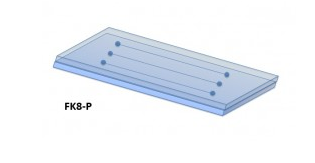 Easily get your specific microfluidic glass chip for your experiments! To offer you this relevant and complementary service, BlackHole Lab works with Klearia, a French and innovative company. You have a great design and need the chip but you can’t or don’t want to do it by yourself? It’s not a problem! We can help you by quickly creating your specific design with high precision. We also offer the possibility to use pre-designed chips that have been already widely used in the field (flow chemistry, analytical chemistry using different electrodes,…). 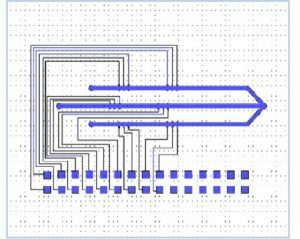 Depending on your needs, we integrate your constraints and design your chips, thus you can concentrate on research and applications. 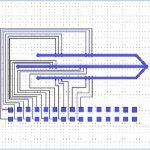 A set of simple design rules and standard formats lets you easily and economically design chips for your specific needs. Our technology allows new embedded functions in a lab-on-a-chip. 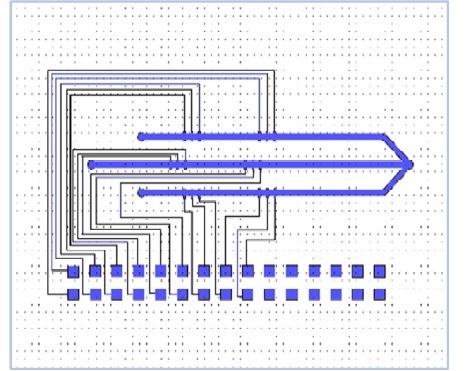 Since now you can imagine new designs; innovating in microfluidics is now possible. LabInGlass®’s microfluidic chips are fabricated with glass (D263, Pyrex 7740, fused silica…) to the highest quality standards. 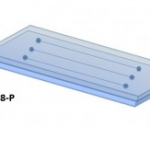 A wide range of patterns are available depending of your microfluidic needs. The range LabInGlass® is made of microreactors and sensors (electrochemical). Our microfluidic solutions integrate spatially controlled functionalization to generate catalytic reactions (metal coating) and that potentially allows to modulate wetting properties (polymers coating). Klearia manufactures devices of one microfluidic channel allowing multiplexing detection. Each microfluidic channel is fitted with 2 sets of 3 electrodes (working electrode WE, counter electrode CE and reference electrode RE). Due to our exclusive and patented technology, we are able to propose different materials for electrochemical sensors: gold, platinum, ITO or carbon electrodes. Klearia develops a new standard for easy fluidic and electrical connections : plug & play, dedicated to confirmed or unexperimented microfluidic users. 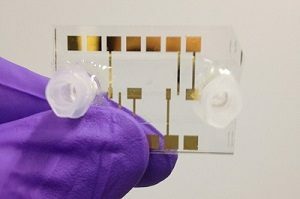 A new way to connect your Lab-On-a-Chip. Insert easily consistent fluid connections to the chip. Lock your device thanks to 4 screws. Connect your electrical instruments in few seconds.